We are so excited about this brand! Created by Colette Haydon a doctor in dermo-pharmacy, Lixirskin was created in her London laboratory. A mix of essential products for everyday skin needs and targeted night care for skin concerns. Lixirskin is based on a less is more principle. Colette believes that an active ingredient used for too long saturates the skin and it no longer delivers results. Vitamin C Paste is a first to market morning gel mask and cleanser. Vitamin C is a wonder ingredient (especially for brightening and boosting collagen) but notoriously difficult to formulate without losing its potency. So when this crossed our desk we couldn’t wait to put it to the test. Apply a layer in the morning, massage with damp fingers, leave for a few minutes if you can then rinse. The Verdict: Skin is instantly brighter. Over time this will improve redness and pigmentation and interestingly this also provides natural UVA & UVB protection. Try to avoid your eyes when rinsing. 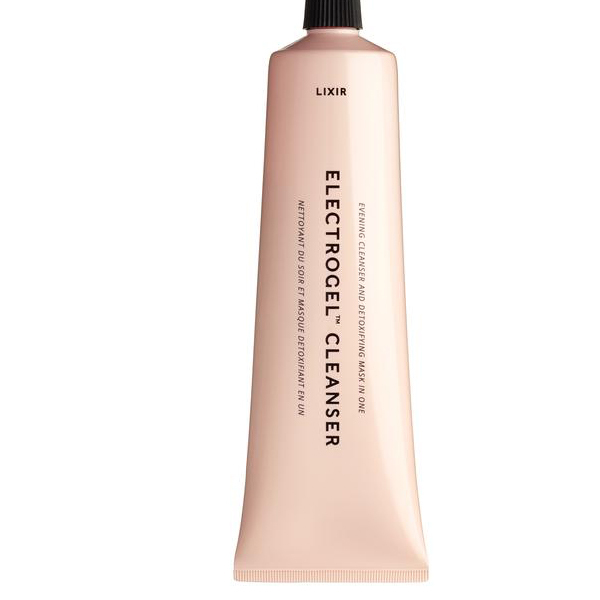 The Electrogel Evening Cleanser and mask dissolves makeup and dirt. The negatively charged Electrogel attracts, captures and eliminates positively charged toxins- pollution nanoparticles, heavy metals and free radicals. The Verdict: Think of it like a skin detox every evening. Suitable for the eye area and all skin types this creamy cleanser preps skin for the next step- repairing with targeted ingredients. 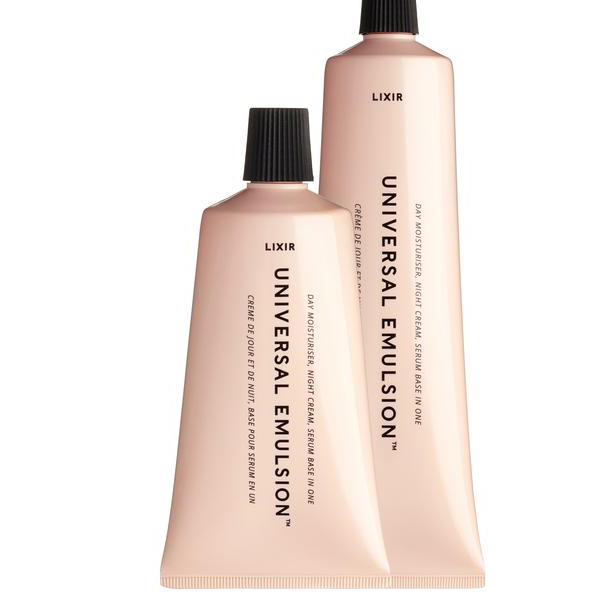 Universal Emulsion- Universal Emulsion is the base product for Lixirskin and is a rich yet quickly absorbed moisturiser used morning and evening. At night time it is designed to be mixed with one of the three ‘Switch’ boosters. Each Switch product is designed to be used every night for a limited period of time so that your skin gets the ultimate benefit and avoiding the plateau effect. 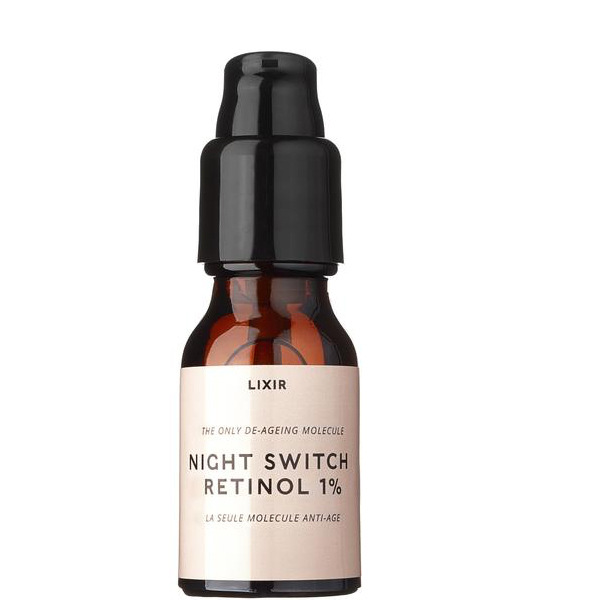 Night Switch Retinol 1% – use one pump mixed with Universal Emulsion for no more than 4 weeks then take a break for a few weeks. Best for anti-ageing by refining texture, reverses sun damage, boosts protein production in the dermal fibroblasts- to give density, volume and firmness. The Verdict: After your first week using Night Switch Retinol 1% you will notice softer and smoother skin and with continued use wrinkles will appear less deep and your facial shape fuller. Do not apply retinol directly to the skin as this is a high dosage and will most likely cause irritation. Night Switch PHA/ AHA 10%- use one pump mixed with Universal Emulsion for no more than 2 weeks then take a break for a few weeks. Best for dull skin in need of exfoliation to reduce pigmentation and even skin tone. This contains a blend of three acids to exfoliate and dislodge dead and strongly pigmented cells. Using PHA also encourages cell turnaround to renew the skin. Lactic Acid improves hydration, Lactobionic Acid reduces oxidative stress (which causes premature ageing) and the third acid is Phytic Acid which eliminates heavy metals to detoxify the skin. The Verdict: Results will be seen quickly with skin looking even-toned, more radiant, plumped and soft. Over the two weeks of use, fine lines, pore size and imperfections such as age spots are visibly reduced. Night Switch BHA/ AHA 10%- use one pump mixed with Universal Emulsion for no more than 3 weeks then take a break for a few weeks. Best for problem skin prone to breakouts. Containing a blend of three acids specially designed to clarify problem-skin. Lactic Acid improves hydration. Salicylic Acid is antibacterial and prevents clogged pores, Azelaic Acid controls sebum. Like the other two Night Switch products results will be seen quickly with your skin looking even-toned, radiant and smoother. The Verdict: Over the course of use breakouts are reduced and you should also see a reduction in fine lines and blackheads. For particularly oily or blemish prone skin you can use this Switch as a mask by applying three pumps on dry skin, leave for 10 minutes and rinse.